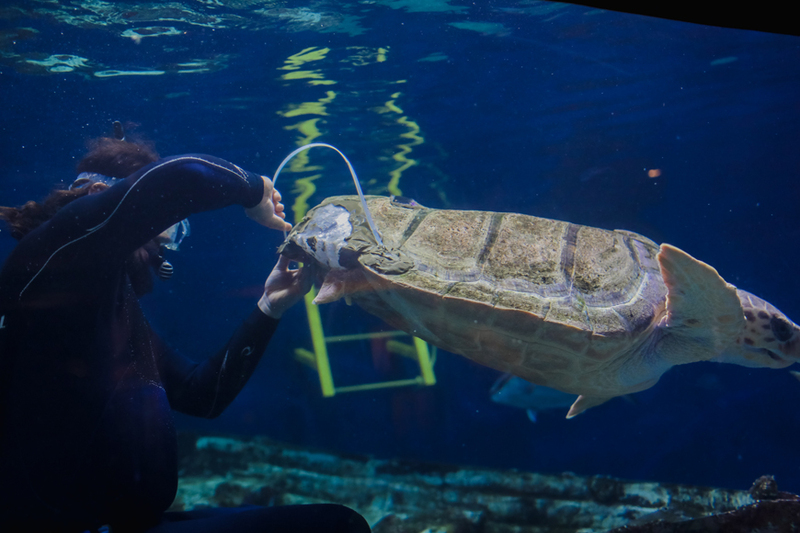 Birch Aquarium's Loggerhead Sea Turtle is fitted with a 3-D Printed brace for her shell. La Jolla, Calif. (Dec. 7, 2017)—Birch Aquarium at Scripps Institution of Oceanography at UC San Diego has teamed up with the Digital Media Lab at UC San Diego’s Geisel Library to create what is believed to be the first 3-D-printed brace for a sea turtle’s shell. The brace is made of a rigid white plastic that was 3-D printed to fit the turtle’s shell precisely. There is a ratcheting plastic cable that attaches to two fasteners to provide strength, support and pressure as needed to allow flexibility as she grows. A velcro neoprene weight pocket is also attached, separately, to help provide neutral buoyancy while she rests. All of the equipment used was adhered with a safe, two-part marine epoxy. The sea turtle, which could grow to as much as 250 pounds—will eventually outgrow the brace and have to be fit for a new one. Year-round, the Loggerhead Sea Turtle lives in Birch Aquarium’s Hall of Fishes’ Magdalena Bay habitat. Every Tuesday and Thursday at 3 p.m., visitors can see the animal training and feedings required to help with her ongoing health care. For more information, or to purchase tickets, visit aquarium.ucsd.edu or call 858.534.FISH. Birch Aquarium at Scripps is the public exploration center for the world-renowned Scripps Institution of Oceanography at UC San Diego. Celebrating its 25th year perched on a bluff overlooking the Pacific Ocean, the aquarium features more than 60 habitats of fishes and invertebrates from the cold waters of the Pacific Northwest to the tropical waters of Mexico and the western Pacific. An interactive museum showcases research discoveries by Scripps scientists on climate, earth and ocean science, and features interactive elements. Accredited by the Association of Zoos and Aquariums, Birch Aquarium has an annual attendance of more than 460,000, including 40,000 school children. Geisel Library’s Digital Media Lab (DML) is open to all UCSD faculty, staff, and students, providing a space for media creation and editing. The lab offers free 3-D printing, video editing, image manipulation, sound editing and expert consultation.